We’ve spent the last year writing blogs that poke fun at our members, this year we decided to start off with a little bit of fun at the expense of our referees. 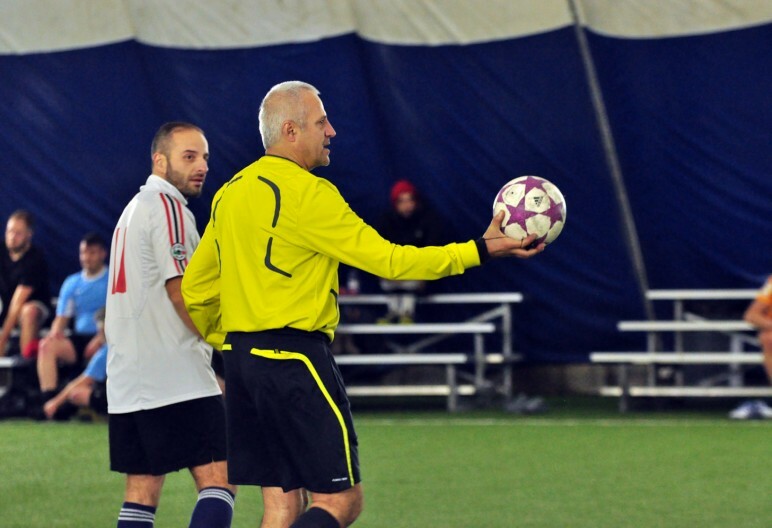 Over the years the team here at Polson Pier has seen a lot of refereeing performances, and after brief discussion, we’ve come up with a list of things that our refs should never say or do. Complain about the cold: When a ref complains about how cold the dome is, it’s usually received as a symptom of scoreboard syndrome; when an imaginary bike chain grows out of a referee’s rear pocket region and anchors on to the scoreboard (Web M.D., 2016). Converse with spectators during play: It’s nice when a ref interacts with those looking on every now and again; maybe greet a familiar face in the crowd. However, as much as every ref likes to believe they are a master at multitasking, calls are far more believable when the ref is actually placing his focus 100% on the game. As a wise ref once told me, it’s not as much about making the right call as it is about selling the call. Be 15+ minutes behind schedule: There are a million and one ways to fall behind schedule, especially on the busier nights. A few typical examples include running out to the washroom after every half, chatting up the female players and spectators, not showing up on time, and the list goes on. This often causes a chain reaction, and before you know it games that were supposed to begin at 11:30pm are now beginning at 11:45pm or midnight on a work night, and the convenors are forced to be there till the wee hours of the morning. The extra ten minutes lost may seem like no big deal at 6:05pm, but they cause a world of hurt later on. Show-up players with their superior ball skills: No one likes a showboat. It’s half time in a Div 5 South match and you pass the ball back to the ref. Now your team has just played the most woeful footy in years and you couldn’t even manage to string together five passes to save your own lives. Now, here comes the referee with his bag of tricks: gut-wrenching, morale-shattering ball skills that make you just want to pack it up and retire. Stop it, just stop it. Wear the wrong attire: Did you know there is fashionable ref wear? No seriously, that’s a real thing! There are refs out here suiting up harder than most players. We’ve seen refs fully equipped in snowsuits, toques and gloves or five layers of sweaters, which make it near impossible for them to even raise their arm to make a call. We’ve also seen refs with Diego Costa style short sleeves and gloves combinations, or El Fenomeno Ronaldo style leg warmers, but the line must be drawn at Edgar Davids style goggles. No—just no.